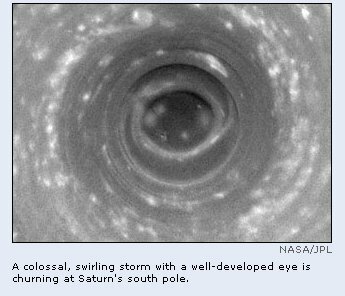 WASHINGTON (Nov. 10) - A colossal, swirling storm with a well-developed eye is churning at Saturn's south pole, the first time a truly hurricane-like storm has been detected on a planet other than Earth, NASA images showed on Thursday. WIN A HEATHER NOVA WONDERFULLY WHIFFY CANDLE! The Great British luxury gift brand Wonderfully Whiffy has generously donated a signed Heather Nova Island candle for a raffle, whose profits will go to Heather Nova's chosen charity, the Bermuda Zoological Society. Go to the section "Charities, Heather's Candle" to read the complete article (and how to win a signed Heather Nova Island candle). Although we’re living in an age of Information Technology, where we can use the Internet to find all the information we need (though not all the information you find on the virtual ocean can be considered as a trustful source), and reading lots’ of information on the screen. Still, I believe that we need a hard copy on paper instead, when reading lot’s of pages and that includes books. You can call me old fashioned, but I have to disagree with you. You can learn more from reading a book on paper (and it’s easier to add your own comments on a page) than reading an electronic version of the book. That’s why I doubt that printed matter will be replaced by electronic versions for the generations. Believe me, or not, that reading the ‘SorrowJoy’, Heather’s book with lovely poems, on the screen, isn’t the same than reading it on paper. And that goes for many other books too. I decided to start this new section on our Online Magazine because I love to read a lot and love to share the information about new publications of books with you. Monstrous Mansions by Laura Simmons, a couple of eco-conscious aliens battle suburban sprawl to save a community go to the section "book reviews,Children's Book" to read the complete review. In "One Town's Terror: 9/11, Iraq and Burlington, Vermont," Robert Ivker weaves together the lives of several Burlington residents immensely affected by the tragedy of September 11, 2001. Go to the section "book reviews, documentary" to read the complete review. "Provocative and profound ... a brilliant historical examination and re-evaluation of the facts... a richer, and truer portrait of both Jesus and Paul, one that both biblical scholars and discerning readers should appreciate." Go to the section "book reviews, history" to read the complete review. Six Years That Shook the World by William Koss gives a fascinating history of the Internet, telecommunications and the fiber optic revolution. Go to the section "book reviews, history" to read the complete review. Uber-Veteran and Medal of Honor recipient George E. Wahlen has spent a lifetime trying to forget about Iwo Jima. For over 60 years, the full scope of his heroics have never been divulged. Now, Bob Dole, James Bradley (author of Flags of our Fathers) and Sen. Orrin Hatch have joined forces to help tell Wahlen's story… still recognized as one of the greatest stories of heroism in U.S. military history. Go to the section "book reviews, history" to read the complete review. Good Versus Evil in a Stunning Tolkien-like Epic Elements of Celtic myths pervade J. Michael Robertson's thrilling fantasy of a dark battle on a re-imagined Earth, Warrior of the Three Moons. Go to the section "book reviews, fantasy" to read the complete review. 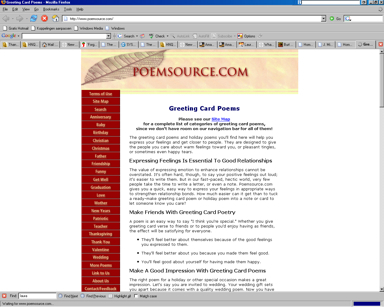 New, original, Thanksgiving, Christmas and New Year Poems, Toasts and Prayers are now available at poemsource.com. November 5, 2006 -- As the end-of-year holidays approach, millions of Web searchers are looking for holiday poems for their greeting cards, e-cards and programs, Thanksgiving and Christmas prayers to be said over holiday dinners, and New Year toasts to be used at New Year's Eve parties. TV4U, Inc. is launching its Western Channel on the TV4U.US internet television network with such classic shows as Bonanza, The Lone Range, The Rifleman, and Wagon Train. Henderson, NV November 5, 2006 -- TV4U, Inc. has launched its Western Channel on www.tv4u.us. Top Western TV classics Bonanza, Wagon (PRWEB) November 5, 2006 -- Train, Shotgun Slade, Jim Bowie, Kit Carson, The Lone Ranger, and The Rifleman are all offered free to web viewers in their entirety. What's more, while ad supported, each of the shows are shown on an uninterrupted basis. 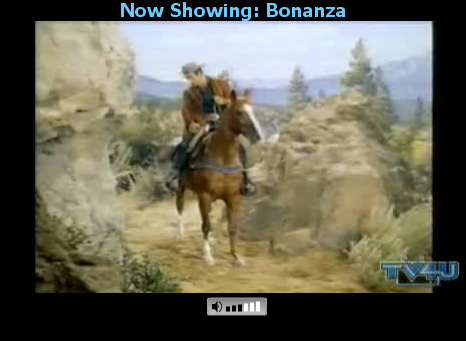 Bonanza was the top TV Western, the first produced in big budget color as a way for RCA to sell Color TV sets through their NBC Television Network. The show ran for 14 years and made stars of Michael Landon, Lorne Greene, Pernell Roberts, and Dan Blocker. Producer/Director BJ Davis submits a request to have his Director's credit replaced with a pseudonym "Alan Smithee", which is commonly used in the entertainment industry by Directors who wish to disassociate themselves from the film. This decision by the film's Director normally serves as a signal to the industry from a creative rights point of view that the show had been tampered with.